This 4-bedroom duplex apartment is located in a quiet street in the heart of the city. On the third floor, you will love the open and bright 35 sq.m living area (living room, dining room, and open plan kitchen separated by the open spaces), one bedroom, and one small tiled bathroom with a walk-in shower, a separated toilet, and a small washbasin. On the fourth floor, there is a large (20 sq.m) air conditioned bedroom opening into a 30 sq.m terrace with a 180-degree view of the city on the south west side and partial sea view. Completely renovated in 2011 with high quality materials, the apartment has been well furnished and equipped to make you have a comfortable stay. On the greenery surrounded terrace partially shaded by a linen pergola, you can enjoy your breakfast and lunch. During the day, you can also relax on the deck chairs without being overlooked. Household appliances are brand new (a dishwasher, a washing machine, a tumble dryer, a traditional oven, a microwave, a large fridge, and a 3-drawer freezer) as well as small appliances (toaster, filter coffee maker, espresso coffee machine, mixer, etc.). The beaches, the harbour, the promenade, the cinema, the cultural and tourist activities, the markets, and the shopping facilities. 2 minutes away, you will find the old harbour, the fish market, the Victor-Hugo and République Provencal markets, Monoprix, the 7 cinemas, all the shops, and the tourist office. - 4 minutes away, you will find Veillat beach, Fréjus beach, the promenade with many activities, parking spaces, and an Intermarché supermarket. If you want to go out without car, 3 minutes away, the SNCF train station and the bus station can take you to Fréjus, Saint-Tropez, Haut-Var, Cannes, and Nice. - The maritime station, at the old harbour, can also take you to Saint Tropez, Agay, the Lerins Islands, etc. I am a member of a family from Saint-Raphaël. I love Saint-Raphaël and its surroundings, where I have lived my youth with my family. I also love Paris, where I have worked as an etiologist, and where my sons and grand children lived. My great grandmother bought the building where the apartment is located in 1850. On the third floor, my uncle built the house on the roof and the terrace in 1959. My sister and I inherited this building in 1998. We have completely renovated it in 2001. On the third floor, the house on the roof and the terrace has been arranged as a duplex. In 2011, I started thinking of retirement, and a 'return to the races', that is why I renovated this duplex apartment with its exceptional geographical location, its large areas and exceptional terrace on the city centre. I chose high-quality materials, thinking about my comfort of living. I rent this apartment to recoup my costs and share this pleasure with people who want to discover this lively town and beautiful area on enjoyable and personalized conditions. 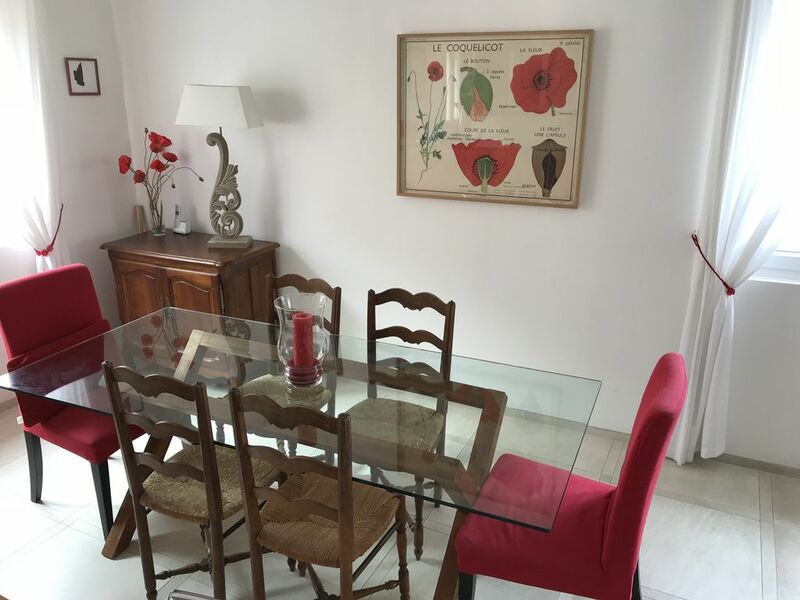 Quiet apartment located in the heart of the historic city, ideal for vacation, or cultural, idleness or sport holidays without car because of the proximity with the TGV train station, beaches and shopping facilities less than 3 minutes away by foot. There are many means of transport by train, by the road or maritime ways convenient to visit the various cultural and tourist sites located less than 50km away. Greatest moments in Saint-Raphaël: During summer: the sun, the sea and the many tourist and cultural attractions. During wintertime: the mildness weather ideal for seaside walks and to relax. Many fairs and cultural events take place during this low season, especially the Light Festival in December and the Mimosa Festival in February. Small and very pleasing tiled bathroom. One window provides clarity and airflow. The walk-in shower is equipped with a colony shower (There is no bathtub). Washbasin in the cloakroom. Free calls for French landlines. For bedding, bathroom, and kitchen. There is not private parking spaces, but there is a municipal parking space 300 m away. You can park your car in front of the building to load and unload your car. A large towel per person Washcloths are not included. There is a large fridge with a 3-drawer freezer. Basic products and a small convenience store are available. Open plan kitchen equipped with new and efficient electric appliances. There are two sinks. 30 sq.m. Equipped with table, 4 chairs, 2 deck chairs and 2 sun loungers. Tap Lamps and electrics outlets. This duplex apartment, on the third floor of the building, which has an elevator, is not suitable for disabled people. The main level ('Ponant' living room and bedroom) are not air-conditioned. However, upstairs, the blue bedroom is air-conditioned and leads to the terrace. This contributes to refresh the third level. Household linen is provided: bed linen, bath and table towels. Beach towels are not provided. A small parasol and beach chair are available on the box terrace. The apartment was less than 10 minutes walk from the train station and 5 minutes walk to the marina. Lots of restaurants and shops along the promenade and a nice walk to Frejus so a perfect location. The kitchen and dining area had everything needed for preparing and cooking meals. The sitting area was small and OK for the 2 of us, however not ideal for a larger party. The terrace was a lovely place to relax and even though the railway was in close proximity it didn't disturb us at all. The apartment is advertised as having an elevator (in the Notes area) but there was none - one of the reasons we were attracted to this apartment was that I had recently had a hip replacement so mobility was a prime consideration - having to climb several flights of stairs with no handrails was a bit difficult. Thank you for this appreciation. I am sorry for the adverstising about the elevator, it is a mistake. I’ll check that (even on the international site) rapidly. We had a wonderful holiday in St. Raphael. This was the fifteenth time in 30 years that we had our holiday here. The apartment was very nice. It was good to stay centrally. We have rarely stayed in such a well-equipped apartment when we have vacationed. We ate all the meals we put in the apartment on the fantastic roof terrace. The communication with Pierre Frank was very good and we thank you for coming straight into the apartment when we arrived at St. Raphael. Heidi and Lars. Nous avons loué pour trois semaines en juin (2 adultes et 3 enfants). L'appartement est moderne, bien équipé, et propre. Il est situé dans le centre ville et tout se fait à pied. Nous avons passé un excellent séjour! Je recommande vivement cette location. Je vous remercie de ce commentaire et suis ravi que votre séjour se soit bien déroulé. Stayed foe two weeks in this apartment. It has an ideal location, a short stroll to the beach,markets,shops and numerous restaurants. The apartment is beautifully decorated, very clean and the kitchen has everything you could need if you decided to prepare a gourmet meal with supplies from the market just around the corner. The roof terrace is ideal for breakfast al fresco, soaking up the sun or sipping a glass of rosé after dining in one of the many nearby restaurants . The apartment is very secure and our French neighbours on the second floor were very friendly. We will definitely be returning to this apartment and would recommend it to our friends. Just a word of thanks to Lionel who met us with the keys very late at night after our flight was delayed. On a passé un excellent sejour dans l`appartement de Mr Thomé. C'est une très jolie maison, bien équipée et avec une terrasse sur le toit enchanteur. C`est une location parfaite en tout point. La maison est cinq minutes a pied de la plage et une minute des restaurants. Nous espérons bien revenir une prochaine fois, encore merci! Wir waren im Februar in dieser Wohnung, und waren sehr zufrieden. Zusätzlich dazu, dass das Wetter schon angenehm mild war, hatte auch die Wohnung wirklich alles was man sich wünschen konnte. Eine sehr gute Raumaufteilung mit einem netten Zimmer mit Terrasse im Obergeschoss, wo die Kinder sich sehr wohl fühlten, unten ein nettes Schlafzimmer und einen großen Wohnbereich mit Essbar. Die Einrichtung und Ausstattung war sehr liebevoll zusammen gestellt und es fehlte wirklich an gar nichts, auch in der Küche. Zudem war die Kommunikation mit dem Vermieter und dessen sehr netter Tante, die ihn bei der Übergabe vertrat, sehr angenehm. Wir wollen gerne einmal wieder kommen. - Saint-Tropez: 39 km (1 h by boat or by car). Created in 1895, the golf course of Valescure, surrounded by pine trees, is the oldest course in Var, and the fifth in the 5005 meters long and Par 68, its design is similar to a British golf course. It is very appreciated by those who love golf. Des frais de blanchisserie et de ménage s'ajoutent à la location et sont variables en fonction du nombre de personne. En juillet et août, la durée minimum de la location est de 2 semaines. Tarif dégressif uniquement pour une durée d'au moins 3 semaines. Les jours d'arrivée et de départ sont négociables en dehors de la très haute saison, sous réserve de disponibilité.